It is something I thought I would never see, the manager of a British team hugging the winner of a major race. 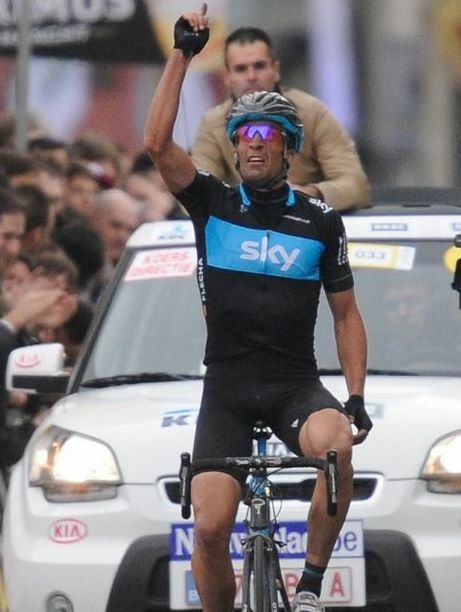 Juan Antonio Flecha crossed the line in Gent with his trademark bow and arrow victory salute then grabbed the Sky logo on his jersey and finally rolled to a halt beside a stunned looking David Brailford. I watched the last 70km of Het Nieuwsblad on the computer and it was all good stuff. Boonen launched a massive attack on the Taaienberg to get a good gap and then cruised up the Molenberg to allow a select few to rejoin but there was then a general regrouping. A number of the favourites suffered misfortune including Nick Nuyens who punctured and later had to wait a long time for a bike change when in the Flecha group. Phillippe Gilbert slid off on a corner and Boonen punctured and took a wheel from a team mate. Eventually we had Gilbert, Roelandts (both Lotto), Flecha and the amazing Frederic Guesdon who had been away in a four man break since km ten at the front. On the last section of cobbles Gilbert attacked but Flecha got across and then jumped the Belgian who was later rejoined by Roelandts and Guesdon. In the bunch, which was just 40 sec. behind Flecha with 10km to go, only Haussler wanted to race. He put a little team mate on the front pulling the bunch along for miles and then Haussler attacked after Gilbert etc were caught. He gained a few seconds but was re-caught in the finishing straight but still hung on for a podium place. Flecha’s race was flawless, he did everything just right and Haussler was truly impressive if, as usual, unable to conserve his energy. But for me the man of the race was Guesdon. In the finale there was no evidence of his race long exploit and he was at least the equal of Roelandts and probably Gilbert also.